The Beverly Hilton kicks off the 2019 awards season with the unveiling of the official menu for the 76th Annual Golden Globe Awards. The Beverly Hilton’s Executive Chef Matthew Morgan and Executive Pastry Chef Thomas Henzi today unveiled the new menu created exclusively for the 76th Annual Golden Globe Awards, to be served to 1,300 of Hollywood’s elite in the hotel’s famed International Ballroom. Additional highlights of the menu reveal include a preview of the official cocktail created by Moët & Chandon and a sneak peek at the floral centerpieces for the tables by celebrity florist Mark Held of MARK’S GARDEN. The Beverly Hilton’s Executive Chefs curated a delicious three-course menu for the Golden Globes that is based around fresh, local and seasonal ingredients. The meal begins with a Sweet Potato Vichyssoise appetizer, a vibrant take on a classic consisting of golden leeks, organic red garnet yams and roasted pepitas, topped with wild micro chives that Chef Matthew planted specifically for the dish. For the main course, guests may choose between a fish entrée and a vegan entrée. 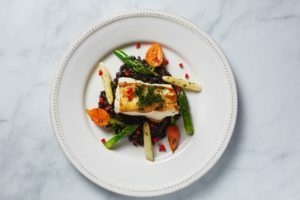 The Chilean Seabass entrée is served with forbidden black rice, white and green asparagus, globe carrots, crispy herb leaves and sweet pepper concasse. The vegan option is a local organic Stuffed Honeynut Squash served with piquillo pepper hummus, braised rainbow chard, crispy chickpeas, quinoa, golden raisins and sunflower sprouts. To round out the meal, guests will enjoy a dessert of Pistachio Cream Cheese Ivory, a flourless chocolate cake with vanilla kirsch genoise and a cream cheese charlotte pistachio center. Moët & Chandon will toast the 76th annual Golden Globe Awards with over 1,500 Moët & Chandon Impérial minis, 125 cases of Moët & Chandon Grand Vintage 2008 and Moet Rosé Impérial magnums and 500 cocktails featuring Moët & Chandon Impérial. In addition, Moët will unveil this year’s official cocktail created by actress and filmmaker, Camilla Belle. Glamorous yet simple to make at home, “The Moët Belle” cocktail embodies the effervescence, glamour and magic of cinema, while celebrating the Golden Globes’ international influence on the world of cinema. A nod to the night’s merging of cultures, Belle draws from her Brazilian roots to create a bold cocktail that transports you to South America. The stunning cocktail playfully captures the boldness and creativity that shines on Hollywood’s biggest night with a cocktail that mixes sweet and tart notes and beautifully sparkles with a white orchid garnish. 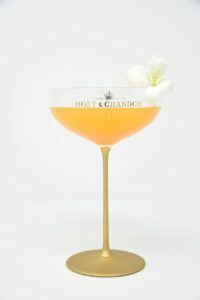 “The Moët Belle” plays to the senses with the tropical aroma of mango paired beautifully with the bright fruitiness and elegant maturity of Moët’s iconic champagne, Moët & Chandon Impérial.